I can’t remember anymore have I blogged about my deep and utterly incomprehensible love towards my phone, Nokia N95. If I have, I apologize. If I haven’t, may I do so? Oh never mind, I will anyway. Nokia N95 is a LOVERLY phone. I couldn’t have picked a better one to serve my needs. It has a great camera, excellent screen, wifi, 3G and what not. The only things that I’ve got problems with is the battery life (which I’ve deteriorated myself by using the phone for four months as a 3G modem a minimum of 8 hours a day, being attached to the charger all the time) and the position of the audio/video outlet. Anyway, Nokia N95 comes with a software that allows you to send your photos DIRECTLY to Flickr. Since I’ve used Flickr before and even paid for it before buying my phone, I couldn’t be happier. Now that I don’t have to worry about when I’ll be able to take the pictures from the memory card to put on the net or worry about backups, AND now that I carry my camera (5Mpix Carl Zeiss optics, thank you very much) … err phone around all the time, the amount of my photos has multiplicated since I bought it. There’s only one problem – I’d like to have the pictures on my own computer too. Ain’t that grand or what? Now you must be seething with anxiety to download the script. HERE IT IS. I hope it will offer you as much fun as it did to me while hacking it up. If you find bugs (eeek) or preferably, if you find bugs and have fixed them and want to send me a bug fix, please contact me. 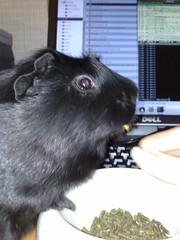 Those of you who’ve managed to read this far, here’s a picture of the coding guinea pig mascot, which tried to assist in making of the script. This entry was posted in ICT, Tips'n'Tricks and tagged bash, EXIF, F-spot, Flickr, Nokia, Nokia N95, procrastination. Bookmark the permalink.